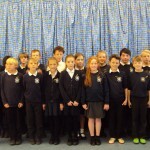 At Great Bardfield Primary School our Year 6 children work to earn a Prefect Badge. Lead play and support the Year 5 children to get ready to take over the role of Playleaders after February Half Term. Help in the hall at Dinner Time to serve dessert, cut up younger children’s food and model excellent behaviour.